The Chisago Lakes area in Minnesota is well known for its quaint and charming communities, which link together to form a larger community, along the shores of the Chisago Lakes. These communities include Center City, Taylor Falls, Lindstrom, Shafer, and Chisago City. Though each community fosters its own unique identity, they all share a few commonalities. These are active communities that embrace outdoor recreation, they have a thriving arts community, and they foster a shared quality of life. One of the most interesting attractions shared by these communities is the Chisago Lakes Water Trail. 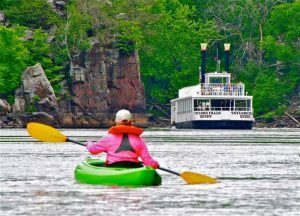 The water trail is yours to explore when you book a room at our Minnesota Bed and Breakfast. Throughout the summer in Center City, getting out on the water is a priority for many. Summer time is the perfect time to take advantage of the longer days, soaking up those warming rays of sun. It’s also the perfect time to grab a kayak or canoe and paddle the Chisago Lakes Water Trail. The Chisago Lakes Water Trail is your chance to explore 10 unique lakes and over 100 miles of shoreline. Along the way, you’ll enjoy moments of solitude as you explore these pristine shorelines, islands, and peninsulas. There are two main trailheads onto the Chisago Lakes Water Trail; one on the east end of the lake system in Chisago City, and the other on the west end of the lake system in Lindstrom. Other than that, the trail can be accessed through a variety of Minnesota DNR boat ramps, city and county parks, city beaches, lakeshore restaurants, and motels. Throughout the summer, take your canoe, kayak, or paddle board along portions of the trail to enjoy swimming, fishing, bird watching, and hiking in the local trails or wilderness parks. Some of the smaller lakes are undeveloped, offering the solitude you expect from the wilderness, despite being only 35 minutes north of Minneapolis/St. Paul. From our location in Center City, we recommend you start with the day trip itinerary for North Center or South Center Lake, where you’ll be able to explore downtown Center City and Pancake Island. To experience the Chisago Lakes Water Trail this summer, all you need to do is book your room at our Minnesota Bed and Breakfast.